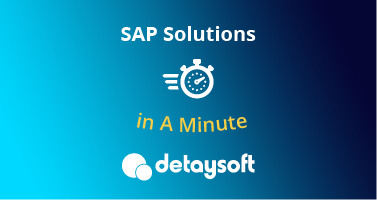 Detaysoft, the largest SAP solution partner with 100 percent Turkish capital, follows its vision of constant innovation since its founding in 1999, and elevates the business processes of clients to world standards while offering solutions for organizations that aim for growth through digital transformation. As a top-level SAP Platinum | Global Partner, Detaysoft offers innovative solutions developed in its R&D Center as well as end-to-end SAP solutions for customer needs through consultants specialized in all SAP modules. Detaysoft carries out projects that improve business efficiency of organizations, leading digital transformation in all industries. With a team of 400 employees working at the company’s head office in Istanbul and Sivas office, Detaysoft serves over 300 active clients, which are leaders of their respective industries. Detaysoft is also among the organizations that provide IT consultancy within the scope of the Turquality support program. Detaysoft is the Turkish member of United VARs, which accepts members based on various criteria such as service quality, product range, global service capabilities and leading technological innovations and engages in successful collaborations. Detaysoft is the leader of innovative SAP technologies such as S/4HANA, SuccessFactors, C4/HANA, SCP and Leonardo in Turkey and introduces many firsts to organizations together with its business units. Detaysoft makes continuous investments to position developing technologies according to customer needs and goals, and provides its clients from diverse industries with competitive advantage by interpreting Big Data. Detaysoft makes a difference in the digital transformation journey of its clients and offers SAP solutions under the headings of ERP and Digital Core, Digital Platform, Procurement and Networks, Analytics, Customer Experience, IoT and Digital Supply Chain, People Engagement and Finance. Detaysoft also provides such services as SAP License Maintenance Services, Implementation and System Support Services, SAP Technology and Implementation Consultancy and Outsourcing. Detaysoft develops innovative solutions supported by TÜBİTAK (The Scientific and Technological Research Council of Turkey) in its R&D Center and offers the digital publishing platform GalePress, applications including e-Invoice, e-Ledger, e-Archive, e-Waybill, Digital Signature, e-Reconciliation, e-Prescription, e-SGK, e-Health and e-Account Statement within the scope of digital transformation, as well as Fiori, UI5, business and mobile applications, social communication platform B-Net and solutions such as B-Pack, C-Pack and QuİK Pack in the field of analytics in the Turkish market. With more than a thousand projects successfully completed to date, Detaysoft is the winner of the marketing best practice award presented to international SAP partners. Detaysoft maintains its title as “Partner with the Most Cloud Based SAP Projects completed in Turkey” with a succession of awards won in the recent years. These awards include SAP Analytics Project of the Year, Best cloud service for markets and Best cloud transformation methods at the EuroCloud Awards, Data Transformation of the Year and highest Cloud Analytics & Insight revenue generating partner award among others. 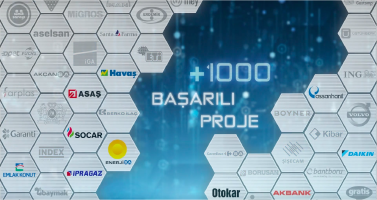 The ERP Transformation Project of Üstünberk Holding, supported by Detaysoft, won the first prize in Turkey and also a Bronze at the SAP EMEA Quality Awards, in which hundreds of important projects from Europe, Middle East and Africa competed. In addition to winning a number of SAP Quality Awards for its projects with İGA (Istanbul Airport), CarrefourSA, Akçansa, Kibar Holding and Erdemir, Detaysoft was also awarded with the Project of the Year titles for its work with İndex, Aselsan and Garanti Bank. Click to view Detaysoft's brochure.